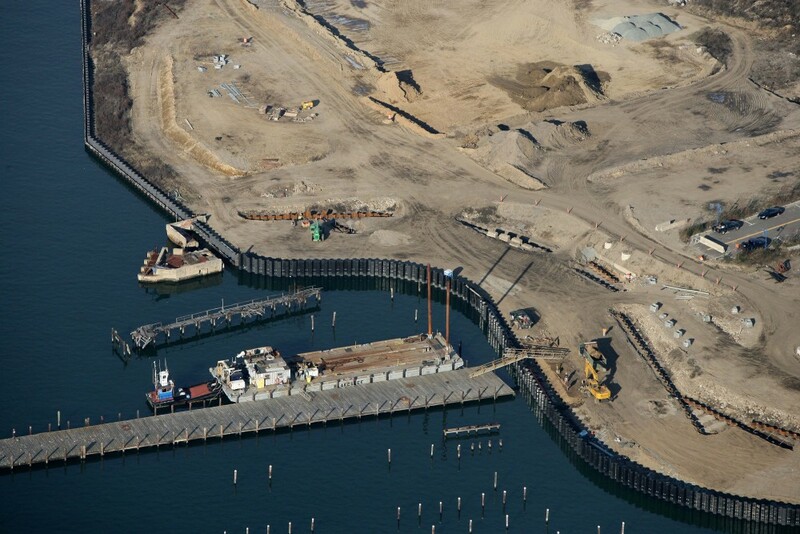 The bulkhead work along Bridgeport Harbor at Steelpointe reached its first milestone recently. Mark Summers, VP of Development for Bridgeport Landing said, “We had a symbolic ‘topping off’ ceremony that included construction workers placing a tree at the eastern most end of the bulkhead.” The ceremony took place after the last of 686 50-foot long sheet piles were driven 30 feet into the water, bringing this phase of the work to about 65-70% completion. 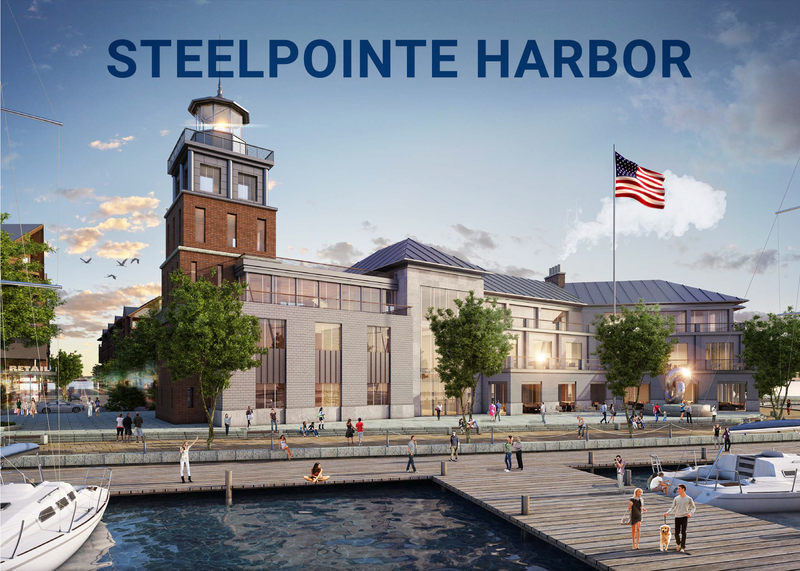 Steelpointe Harbor’s new 1,600 linear foot bulkhead will serve as a watertight retaining wall used to contain flooding and slow erosion along the waterfront. 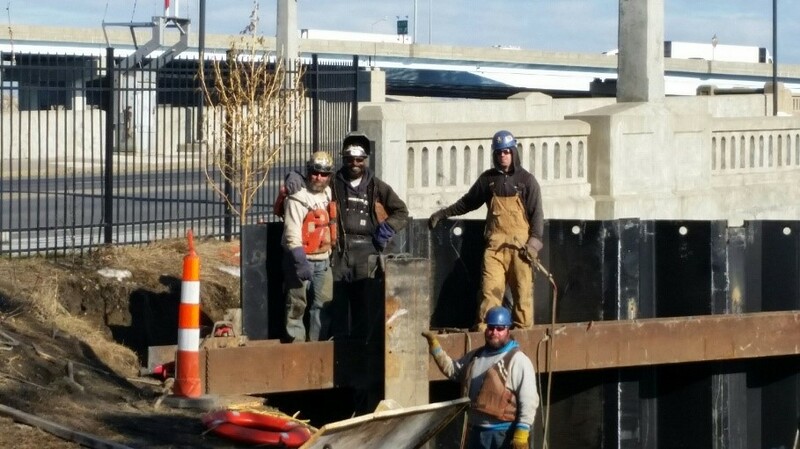 “Bulkhead workers place tree on final sheet pile as part of “Topping Off” ceremony. “We are about a third of the way through installing the 197 tie-back rods that will secure the sheet piles to the deadmen 70ft. inland” commented Summers. The tensioning of the tie rods will be completed in May 2016 followed by the backfilling and compacting to a height of 10.5’, preparing the waterfront for the final surface of the public access Harbor walk. Then, once the bulkhead is completed and the land is filled to appropriate height for construction compliance with Federal Emergency Management Agency (FEMA) regulations, vertical construction on the south side of Stratford Avenue can begin. This spring, after the installation of the bulkhead, BLD will move forward on construction of the public access Harbor Walk and a 45,000 square-foot Marina building. The Marina building will feature casual dining on the ground level, a white linen tablecloth restaurant on the second floor overlooking the harbor, and retail shops to accommodate the needs of our 200 boat slips that will be available for seasonal and transient mooring. The marina construction will include limited dredging in accordance with Connecticut Department of Energy & Environmental Protection (DEEP) permits.